The site further describes it as an engaging color welcoming and encouraging lighthearted activity, making it a perfect addition to the home! Adding Living Coral into your space, either as a statement or an accent, won’t just look great, but will apparently set exactly the vibe you are going for. While the color might be very specific for some tastes, it can be used in a variety of ways to fit all decor styles. From luxe velvet accent chairs to more traditional side tables to modern patterns, this color will find its way into any room. Shop these five perfect ways to add in the new hue into your home. There’s no better way to accent your home with Pantone’s color of the year than with an actual accent chair. 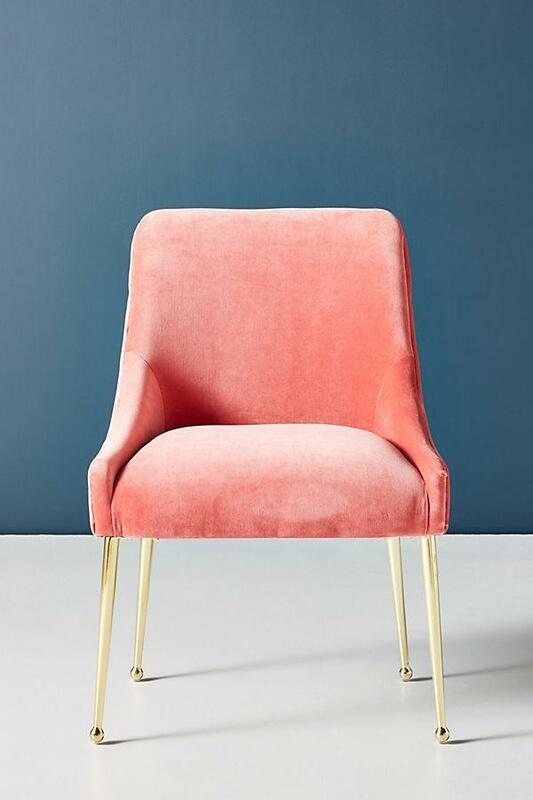 The plush velvet upholstery of this slipper chair takes on the fresh coral color of 2019. The design works perfectly as an extra element in a living room, but bump your order up to two, and watch them shine at the heads of your dining room table. Bring in other decor elements to match your new color scheme or leave these on their own for a whimsical touch. The gold finish of the chair legs and brass back handle will be more than enough to tie in with the other luxe elements in the room. Originally on sale for $398, now on sale for $299. For an accent that really packs a punch, look no further than this side table. The desert coral is rich, but the simple design of the table gives it a perfect balance. Its single drawer is perfect for storing away anything unsightly, but the table top and shelf below are perfect for putting your finest trinkets on display. Books, candles, plants and more can find a home here with endless ways to style them. Keep in mind complementary colors like aqua, seafoam and a subtle peach when you are considering which decor items to display. 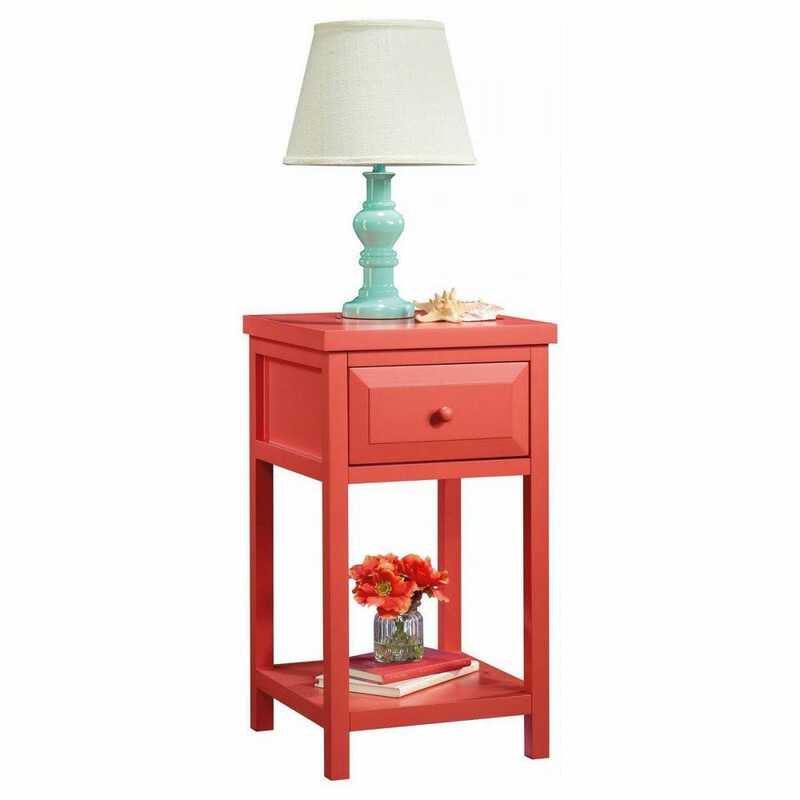 As for placement, this accent table could easily be a dropping point in an entryway, or house the remotes in the TV room or a stack of books as a bedside table. On sale for $95. 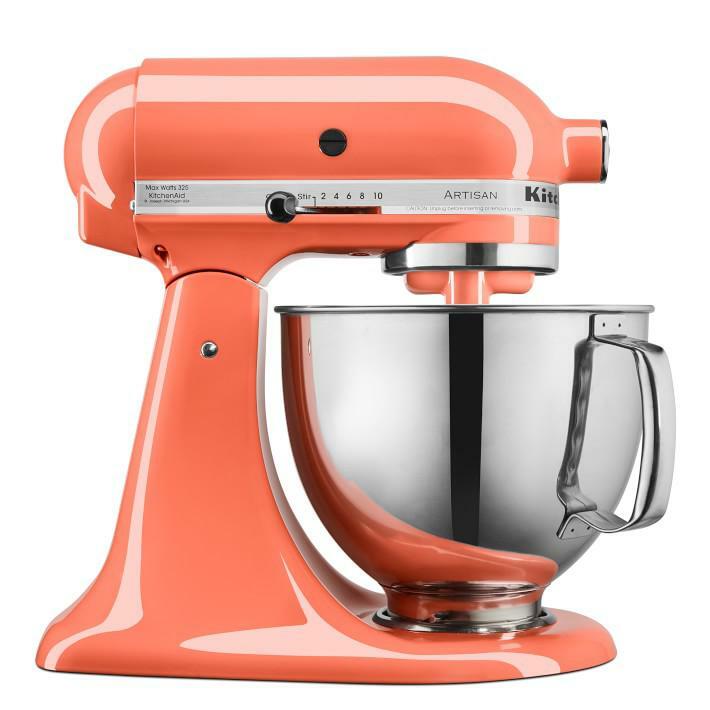 As is the case for most proud KitchenAid owners, the mixer stays prominently displayed on the kitchen counter. Instantly brighten up the space by going with the “Birds of Paradise” color. You and your guests won’t be able to stop admiring the high-gloss finish of the coral hue. You can let this new addition inspire an entire kitchen facelift. Swap your hand towels, dishes and other small kitchen appliances all to match your new colors. Whatever confectionary wonder the mixer produces it can be severed on matching plates and with matching cutlery for dramatic flair. Originally on sale for $500, now on sale for $280. If a full table or chair is a little too much of Living Coral for your taste, there are much more subtle ways to ease into the trend. Getting new sheets is an easy way to fall back in love with your bed, and that will definitely be the case with this set. 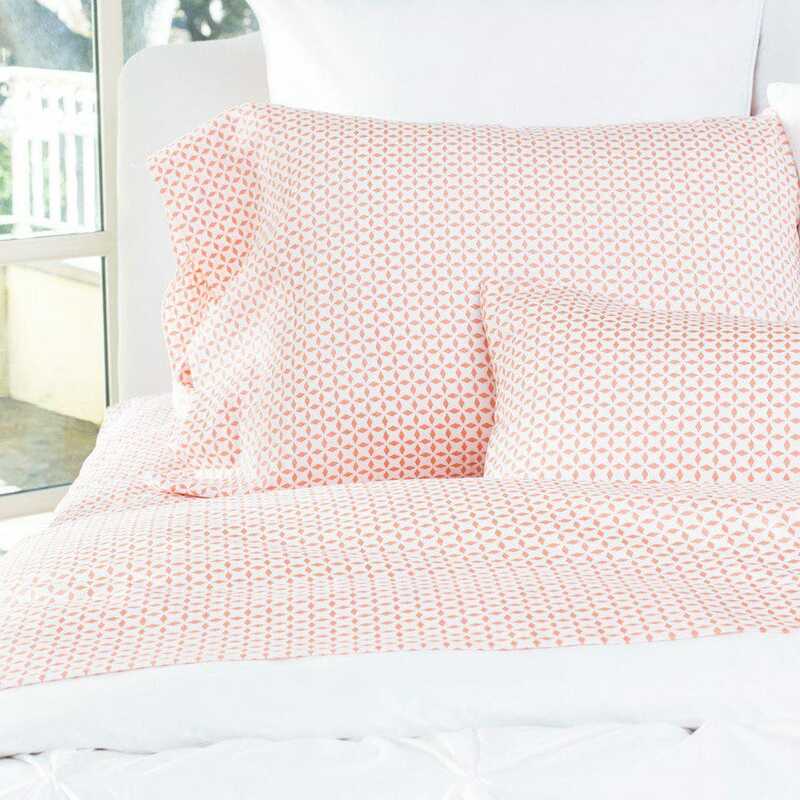 The diamond print in white and coral will instantly brighten the space while also adding in color and texture. Paired with a white or neutral duvet, the sheets will really have an opportunity to stand out and influence the rest of the room. As the color grows on you—and it will—you’ll find yourself adding in matching throw pillows, maybe a lamp or rug and even that accent chair you were once hesitant about. Starting at $119. If you are ever looking for an affordable and easy way to try out something new in your home a throw pillow is a safe choice. Throw pillows are an easy way to play with color and texture in a space without making too much of a commitment. 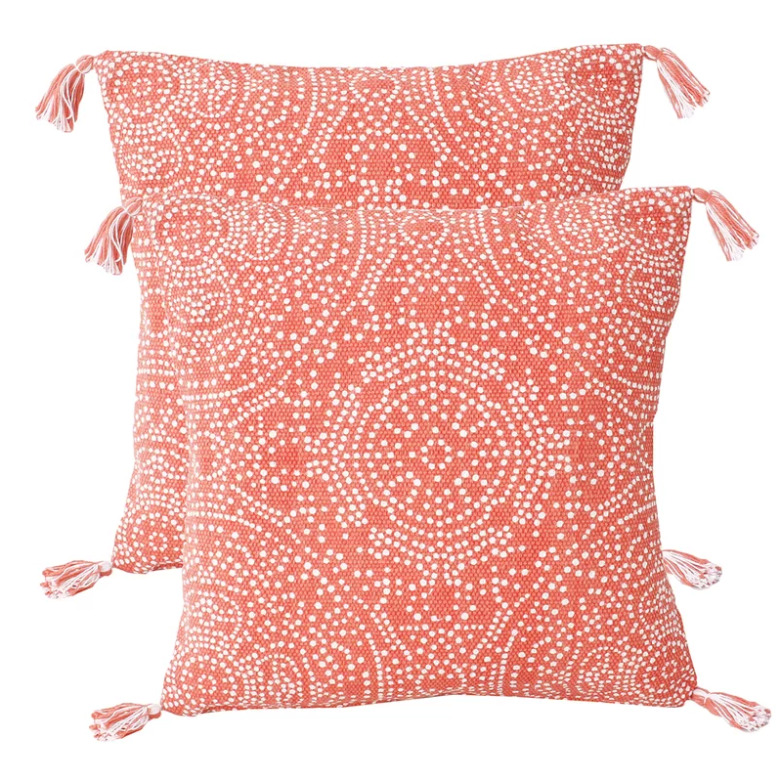 If you are just dipping your toes into Living Coral, these throw pillows are perfect. The pattern breaks up the rich tone while still allowing it to be a bright addition into any room. If you find the coral base of the pillow to be overpowering at times, flip this reversible pillow over to reveal the inverse of the dot design making the color even a more subtle addition but still a significant one. Whether tossed on the couch or on a bed these throw pillows will be the perfect last minute touch to your 2019 redesign. On sale for $50. You’ve hit the trifecta with this table lamp. It brings color, high design and functionality. 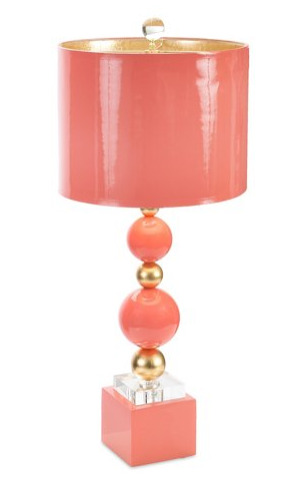 The coral color takes over this light fixture from the base to the lampshade all in a luxurious high-gloss finish. The base features a square block of coral, followed by crystal and spheres of gold, and naturally, more coral. The gold accents are continued inside the lampshade, which will cast a beautifully gilded effect across the room. On sale for $445.